Identification: Upperside is dark brown with orange markings. 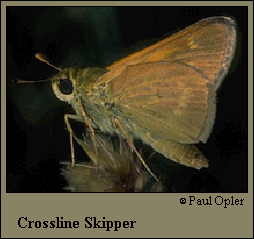 Female usually lacks orange along the forewing costa and has a square spot below the end of the cell; male has a long, straight forewing stigma. Underside of hindwing is orange-brown with a faint band of spots. Life history: Males perch in open grassy areas most of the day to await receptive females. Courtship occurs from midday to mid-afternoon. Third- and fourth-stage caterpillars hibernate. Flight: One brood from June-August in the north, two broods from May-September in the south. Caterpillar hosts: Purpletop (Tridens flavus), little bluestem (Andropogon scoparius), and other grasses. Adult food: White, pink, or purple flowers are preferred including purple vetch, red clover, selfheal, dogbane, shrub houstonia, New Jersey tea, and New York ironweed. Habitat: Open grassy areas including prairies hills, barrens, power line cuts, old fields, forest openings. Range: Western North Dakota east across central Minnesota, southern Ontario, and southern Quebec to central Maine; south to northeast Texas, the Gulf Coast, and northern Florida. A separate population (P. o. rhena) occurs along the Rocky Mountains from northern Colorado to northeastern New Mexico. Conservation: Populations of subspecies rhena, found in patches of all tall-grass prairies, should be conserved wherever found.